I’m not actually complaining about my job. I love being a helicopter pilot but every now and then you come across some things that make you scratch your head and think to yourself that there is probably a better way to go about things. But what do I know – I’m just a young gun making my start in this industry. I do what I’m told and go where the work is needed. A one day mission turned into a week long ordeal, and here is the story of THE WALL OF DOOM…or alternatively, Snoqualmie Pass in the Winter Time…which is probably the more appropriate title. 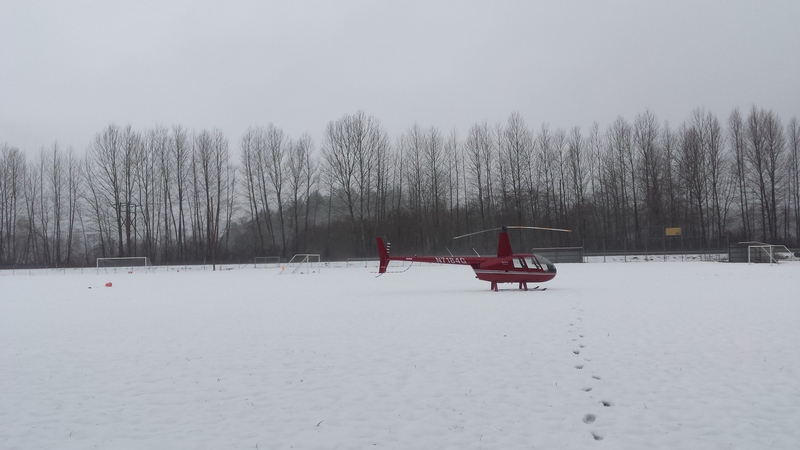 Ferrying a helicopter in the winter time, especially when there is a pass involved, becomes a feats of equal expertise in pilot skill, navigation, meteorological interpretations, and common sense. Just chilling in a field. Nothing to see here.